Looking for a heirloom quality gift that goes beyond Easter morning? I have a small batch of precious art Easter eggs ready for you. Each egg has been painstakenly covered with tiny seed beads and other glimmering treasures then sealed in fragrant beeswax. A true Easter delight! These very special beauties are really a sight to behold. Message me with interest and inquiries. Additional photos upon request. Custom comissions available. And just a reminder that this is the final week to view FAR-OUT WEST online with this groovy interview. 1 large and 4 small eggs avaliable at this time. What exactly is mural season? It’s the small window if time in Tucson between HOT as heck and monsoon season. If you have a wall in need of beautification I’d love ot meet with you. Message me and we can start dreaming together! More of my murals here. When Ghost Gallery invited me to showcase a select group of sculpture from my Soft Spring serise I jumped at the chance. Far-Out West is recent work by myself and artist Ashley Dahlke, another Tucson AZ based artist. The show is LIVE now through April 4, so the time to view Far-Out West online is limited. All the art you see is avaiable for purchase! Message me if anything tickles your fancy. And while you on the site do check out this fun interview with with myself. Thank you Ian for curating this energtic online space! Whether you call them yappers, doggos, bark barks, buppies or just best friend I want to preserve your dog forever in a portrait! On Thursday 2/21 from 6-8pm I will be painting/drawing dog portraits at MOCA Tucson’s Yappy Hour. Portraits are by donation during the event, first come first serve, but if you would like to commission a portrait of your furry friend (open to cats too) in advance of Yappy Hour please message me with imagse of your pet and a little bit of info about their personality. Commissioned portraits are sliding scale starting at $20 and can be fetched at the event. Puppy portraits are pencil and/or ink on paper, like the painting below. Yappy Hour is in coordination with MOCA’s FREE Third Thursday so enjoy the art with your pup for free! MORE INFO about Yappy Hour HERE. If you are in mailing a letter in Tempe anytime you can check out my installation in the group exhibition Retro Reaction II. Other artists included are Adam E. Mendelsohn, George Penaloza and Kristin Bauer. Each of us installed work in a window of the post office which orginally was a chic department store. Mill Ave Post Office is located at 500 South Mill Ave. Thank you City of Tempe, Michelle, Anthony, Ron and Tricky! Along with photos from the installation I’m including answers to questions posed by Tempe specifically for the exhibtion to give insight in to myself, my influences and my work. Name 3 specific artists that have influenced you and why. Three artist that have inspired this work are as follows. Lynda Benglis excites me as an artist and thus inspires my own work. I admire how she moves seamlessly between mediums in unexpected ways. Specifically Benglis' more recent wall hanging paper sculptures which are embellished with glitter btoh surprise and delight me while still feeling familial. Painter Sally Michel's color palette of her dynamic landscape paintings decribes a relationship with land I don't see represented by other artists as joyfully. Michel's ablity to drop into abstraction with ease without losing the land’s defining essence is tenacity I see reflected in my own paintings and sculptures. Fearless Eva Hesse's use of unconventional and experimental materials in her sculptures are like a love letter to not just me as an artist but a woman while reminds me to stay true to my artistic vision even if it doesn’t always make sense. Name of 3 specific artworks that have influenced you and why. My sculpture Modern Ziggurat is directly inspired by Louise Bourgeois' sculpture Lair. While my sculpture mirrors Lair's shape and form Modern Ziggurat's colors make it queerer and therefore less solemn. By embellishing Modern Ziggurat with crystal and pulverized minerals it allows the sculpture to be reflective of the essential elements found in the desert landscape. Modern Ziggurat may stand tall like a mountain but it is a dwelling, a place of spiritual presence. You can also find the influence of Bourgeois' more moundy, mammalian sculptures such as Cumul I in the cloud form in my installation. The monumental pieces of folk art Salvation Mountain near Joshua Tree inspires my own work with it's viberant, energetic and direct hand to the art feel of the creative process which cares little for perfection. I enjoy that Salvation Mountain is one with the landscape and not a separate entity that is so precious and delicate and must only be appreciated in the sealed, dust free, safe space of a gallery. Salvation Mountain is allowed to be free and alive! Werner Herzog's haunting documentary film Cave of Forgotten Dreams explores the crystal coated caves of Chauvet, France in a way that is more art and less science. By experiencing the film we explore a realm of the internal as well as humanity's interaction with the earth over tens of thousands of years which then enlightens us to what it is to be a human in the modern age. Name 3 non-visual art influences or experiences that have inspired you. The act of rock hunting in the desert influences not just my studio work but my dreams at night. Seeking is my only repeatative dream I have. In my dreams I am constantly looking for and finding treasures. It is this conscious and unconscious act that I bring to the studio as part of my process. My experience in 2001 traveling on the Zapatista carvan which traveled from Chiapas to Mexico City to advocate forthe rights of all indiginous people in Mexico has heavily influence my perspective as an artist as well as how I live as citizen of the world. The caravan experience gave me a depth of knowledge of what it means to be an artist whom lives and works in the borderland. My dear friend of over 20 years Jake Shears' self titled solo album which was inspired by living in New Orleans a city which I have roots in and a very emotional connection with as a Katrina survivor, has become the soundtrack in my studio over the past year. Throughout our friendship I have been given insight into the process of the making of the album over the past year and it’s joy of life energy has infused into my work. Wish List. If you could go behind the scenes of some of the local museums for this project- what would be your dream to find? Without a doubt I would love to dive deep into the Museum of International Folk Art in Santa Fe, it's my personal Mecca. To play within The Girard collection of global cultural treasures that have be so lovingly amassed and diplayed in such a unique way would be beyond thrilling. I'd also love to commune with living artifacts of the Heard Museum in hopes of gaining greater insight into the ancestors of the land we now call Arizona. The super cool collage experience known as Cut n’Paste is coming to Tucson! This FREE, ALL-AGES event will be on Saturday, Feburary 2 from 1-4pm at MOCA TUCSON. I’ll be there helping to faciltate the fun! Bonus, while you are at the museum you can immerse yourself in DAZZLED, the phenomenal exhibition currently on display. It’s not to be missed. Come make something lovely for your loved ones just in time for Valentine’s Day. For more info and to RSVP the event go here. See more of my collage work, NEW AGE COLLAGES. Come by, make art, get Dazzled! Crystal studded sea urchins are now at DIRT in the Annex at the Mercado in Tucson. Each magical urchin is cast in from an actual sea urchin thus retaining the unique natural form. The sculpture is then handpainted and studded with quartz crystal points and embellished with retro-reflective micro beads and glow n’ the dark paint. They glitter, they glow, they shine and they sparkle no matter the lighting. The vibration is high on these guys! When I was approached by Sigfus Designs to offer up a limited number of my Tularosa earrings on their website Lauren also brought to me the opportunity for a collaborative fundraiser benefiting Sister Jose Women’s Shelter. Please check out the flyer below and if you live in the Tucson, AZ. area you can donation items at any of the drop-off locations mentioned from 11/23-11/30. THIS WEEK ONLY! Another way to give is buy purchasing a very special pair of earrings created by Sigfus special for this fundraiser. ALL PROFITS will go to directly to Sister Jose! I have small smattering of art currently on display at the sweet as pie location of 5 Points Resturant and Market. Each piece is a mixed media painting on paper, framed and available for purchase through me for $350. Christmas is coming. I’ve teamed up with my pal Lauren from SIGFUS DESIGNS to give away these two pairs of earrings. Designer Lauren Valenzula made the lovely Blossom Earrings on the right and I made the Tularosa earring on the left. ONE winner will win BOTH pairs! TAG a friend you would want to share a pair with! That’s it! ONE WINNER will be selected at random and notified on 11/3. If you are interested in my Tularosa earrings Sigfus will be featuring them on their website for a limited time! So happy to announce the inclusion of my work in the 10x10 an invitational exhibtion benefiting Tohono Chul Garden and Gallery. For 10x10 artists are asked to showcase work no larger than 10x10 inches which is priced at $100 with 50% of the sales going to support Tohono Chul. This exhibtion is such a wonderful opportunity to visit and enjoy the gardens, support living artists, get a good deal on original artwork AND support a thriving Tucson insititution such as Tohono Chul. 10x10 goes on display in the Entry Gallery at Tohono Chul Gallery on Friday, October, 5 and at that time art can be purchased during regular hours. I HIGHLY suggest hustling up there to get first choice! This year I’ve donated 4 mixed media works on paper and at any given time 1 will be on display. Also you can request James or Nicole to show you all my donations. They would be happy help you make yoru decision. Images of my donationed artworks below. Special reception on Friday November, 16 5:30-8pm. 10x10 closes Sunday, December, 16 2018. To see the full series Coffee on Cream click here. Feel free to contact me with any questions about these pieces or any others you may see on my website. Big thank you to everyone who journeyed into Deep Time while the exhibtion was on display. Special thanks to all the positive supporters of this enormous vision at Scottsdale Public Art and the Scottsdale Civic Center Library. It was a great time! Now that I'm back on dry land I've been able to shift focus back to my studio practice and have started creating new work inspired by monsoon season in the Sonoran desert. Check out my IG to see recent landscape paintings created with coffee and glitter! Commissioned by Scottsdale Arts at the Scottsdale Public Library at the Civic Centre, 2018. Here I am sitting in front of The Geology of Mount Sherbet. I like it beg the question, do you know what the first rule of being oppressed is? This cultural and personal philosophy I live my life by. No matter how shameful they want you to feel, never stop being your outrageous self. Never let anyone take away your joy of life. We felt it at Stonewall which birthed the Pride parades we see now in our streets today. We hear it in the heavy bests of the club kids that found solace in chosen family of otherwise outcasts. And we saw it in Orlando where grief was danced to the ground. For me, Pride Wreath, inspired by door hanging Christmas wreath, is symbolic of the triumphant spirit of celebration over oppression. As the stories we tell become more inclusive and the voices we hear are not just the familiar there are more to celebrate, more people at the party. You are invited this Saturday for a special reception for the opening of Deep Time. The Scottsdale Public Library at 3839 N. Drinkwater Blvd. will be open after hours from 6:30-8:30pm for this event that includes, amazing refreshments, fun kid-friendly activities and lots and lots and lots of art. Deep Time the exhibition will be open during regular library hours through out the long hot summer closing on August 24! Creative and infomative workshops will be held in conjunction with the exhibition for adults and children alike, with a special closing reception with music by Tucson based musician LANO on August 11, 6:30-8:30pm. If you aren't able to make it to this temporary immersive exhibition you can follow along on my IG account where there are lots of photos to enjoy! And to top off the excitement of this week, Deep Time got a shout-out in This Is Tucson/Arizona Daily Star as a MUST to do when up Phoenix this summer. Here is everything you need to know about the exhibition, opening reception, workshops all summer long and closing celebration! SCOTTSDALE, Arizona — DEEP TIME: Imagining the Ancient Inland Sea is an immersive, family-friendly experience running May 26–Aug. 24 at the Gallery @ The Library, Scottsdale Civic Center. Presented by Scottsdale Arts, DEEP TIME takes visitors on a journey to the prehistoric ocean that once covered the Sonoran Desert, as imagined through the eyes of Tucson-based artists Lex Gjurasic and Rachel Slick. This sculpted environment uses color, pattern, light, texture and experimental materials to create an ocean-bottom experience of being surrounded by fanciful sea life, including kelp towers, coral reefs, an underwater garden, a bioluminescent tunnel and a large sea beast. Gjurasic said she has reoccurring dreams about seeking and collecting. Her interactions with the desert follow a similar pattern as she finds herself consistently looking for treasures. Gjurasic has shown her work across the United States, from Seattle to Pensacola. Her art can be found as part of the Woman’s Building permanent collection at the Getty Research Institute in Los Angeles. Among her public art experiences are site-specific installations for music festivals. 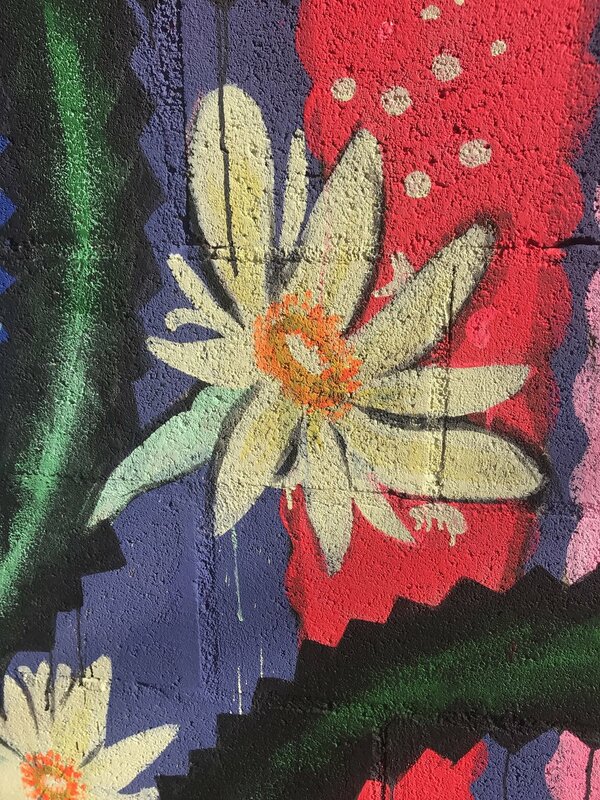 The two artists previously collaborated on the mural Sagrado Corazon de Tucson in downtown Tucson. Slick is represented by galleries in Scottsdale, Albuquerque and Santa Fe and has shown her work throughout the nation, from Los Angeles to Chicago. Among her public art commissions are murals in Tucson, interpretive signs in California and a sculpture in New York. The exhibition also incorporates anthropology, paleontology and geology alongside folktales, legends and myths, providing opportunities for children and adults to learn about the creatures who lived in the prehistoric ocean through a mixture of science, fantasy and imagination. A variety of free activities throughout the summer will enhance the experience with creative workshops and visits from scientific experts. The exhibition will open Saturday, May 26, with a reception from 6:30–8:30 p.m. Slick will take young visitors on a visual journey within the installation from 7–8 p.m. that evening, using an illustrated treasure map. The first 30 participants will receive a signed, special-edition map. DEEP TIME Slime — Friday, June 8, 10:30 a.m.–noon. Learn to make three different types of sea slime. Participants can even take the slime home with them. For ages 8 and older. Create a Mystical Sea Creature — Saturday, June 23, 1–3 p.m. Use recycled materials to create your own fantasy sea creature with artist Tania Radda. All ages. Super Corals! — Saturday, July 14, 1–2 p.m. Scientists are learning how corals can withstand challenging environmental conditions, like warming seas. Learn how “super corals” may save the reefs in this lecture by oceanographer Franklin Lane. Meet a Paleontologist! — Friday, July 27, 2–3 p.m. Discover Arizona’s past as an ancient sea and meet paleontologist David Gilette in this family-friend discussion and workshop, where participants paint replicas of dinosaur teeth to take home. Closing Reception and Performance — Saturday, Aug. 11, 6:30–8:30 p.m. Celebrate DEEP TIME with the artists, light refreshments and a performance by Lano, composer of the exhibit’s soundtrack. For more information, visit ScottsdalePublicArt.org/temporary-art/exhibitions/gallery-civic-center-library. Questions about the exhibit: emailWendyR@ScottsdaleArts.org or call 480-874-4679. Questions about the workshops: email LHales@ScottsdaleArts.org or call 480-874-4642. My heavenly painting Neptune from my Otherworldly series, which was on display last year at Tucson International Airport, was chosen by Tohono Chul Gallery to be a part of their exhibition of the same name! Neptune will be on display in the exhibition Otherworldly at Tohono Chul April, 26 to August 12 in the Main Gallery. An artist reception will be held on Thursday, April 26th, 5:30-8:00pm. To view all of my Otherworldly paintings follow this link. And it's the last week to see Soft Spring at TMA Museum Store. Go by before it's ends! Thank you to everyone who came out last Thursday night to the TMA Museum Store for a celebration of Soft Spring! It was a great evening to revel in springtime energy while enjoying 3 beautifully floral vignettes within the gallery. If you weren't able to make it enjoy these photos below from the event. Do note that Soft Spring will be on display through the end of April in the Museum Store, so it's FREE to visit. View Soft Spring online here and if you see a piece you dig call the TMA Museum Store for availability and pricing. I'm sure they'd happy to ship it to you! And if you can't make it to see the show check out my Soft Spring portfolio of the work. If you see something you love call the TMA Museum Store to request availability and price. Recently I welcomed This Is Tucson into my studio for a chat. The result is this lovely profile and photo essay about my work and the million projects I currently have going on right now. Yes, I am really working on art in these pics and OF COURSE I always do so with glitzy oversized earrings on!